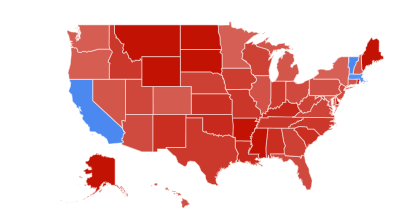 These charts represent the number of searches of the listed terms within the last 12 months by state, according to Google Trends. The top one shows that the term Humvee was searched more than PHEV in all but three states. The darker the red, the greater the imbalance. 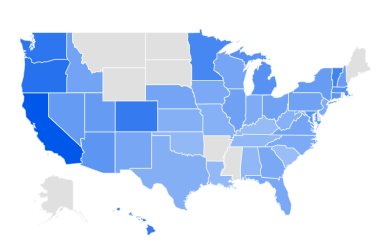 The bottom map shows the highest percentage of searches of the term PHEV without regard to any other terms. For those unfamiliar with cars, a Humvee is a monster of a quasi-military style vehicle, while PHEV stands for Plug-in Hybrid Electric Vehicle. This entry was posted in Uncategorized on April 21, 2019 by Russ. Charlie Cullen is a serial killer, responsible for perhaps as many as 400 deaths. He became known in the press as The Angel of Death when his crimes were finally revealed. He worked as a nurse in several different hospitals in New Jersey and Pennsylvania where he would poison patients by injecting drugs into their IV lines. This fascinating story begins slow. It spends a lot of time detailing how Charlie killed again and again without consequences besides being fired and shuffled off to another hospital to start killing again. The book becomes very frustrating and disappointing until Part II, when the police become involved. The book makes clear how difficult such cases are to investigate and prove, and it clearly identifies some good guys and bad guys. It will make you never want to set foot in a hospital again. This entry was posted in Uncategorized on April 20, 2019 by Russ. After finishing this book I am rip-roaring mad. This title appeared on a list of sci-fi books recommended by the local library and the description looked promising so I went for it. There was no warning anywhere – the cover, the library email, reviews, introduction, foreword, that you need to have read the first two books in the series. It did have the phrase A Planetfall Novel on the cover, but I thought that only meant it was to be the first in a series. I write novels, too, with a continuing main character, but each is a standalone, so the fact that a series exists, even one started with an earlier book, doesn’t mean it’s necessary to read the earlier ones. There should have been some warning that this is number 3. So I’m giving you one now: Read the first two before reading this. Not only that, but be prepared to have the story go unfinished because the author clumsily ends by setting up yet another book in the series leaving this story line undone. The plot was clever enough. Geologist/artist Anna lands on Mars some centuries in a dystopian future and immediately finds things strange. Even though she’s never been there before, she finds a note apparently written to herself in her bunk. It was easy enough to figure out how it got there, although Anna is slow on the uptake with that one. Then a whole lot of time is spent on her relationship with her husband, child, parents, and sister – wasted time in my opinion. The author is imaginative, but the anachronisms, political correctness, and an obvious lack of scientific and technical knowledge by the author crept interrupting the flow of the story as minor annoyances. I can only keep it from one star by the fact that it was interesting enough to keep me reading to the end, even though that disappointing ending was the first place it became clear I needed to have read the first two in the series. And the “ending” was anything but an ending. If you’re enamored of the first two in the series, and want it to go on, then go ahead and start this one, but there was nothing in this one making me think I would have enjoyed the series from the start. This entry was posted in Uncategorized on April 17, 2019 by Russ. I’ve had it with Amazon. I appreciate that it permitted me to become a published author and develop a fan base, but in recent years their policy toward authors has been increasingly unfair. As the saying goes, they keep the elevator and give us the … short shrift. I realized I also don’t care about the royalty money. I make more from my Amazon capital gains than I do from the books. They treat us shareholders a lot better than us authors. So I’ve made all my books free. No strings attached, no ads, just free in digital form. For now it’s only in PDF form, but I may eventually upload a series of html pages, too, for those who want to read in a browser if I find there’s a demand for that. I’ve left the books on Amazon for now and the links for those versions, including the audiobook of Cached Out and all the paperbacks, but I’m in violation of Amazon’s terms of service for making the digital versions free and will probably be kicked off of that platform eventually. Just click on the link below (or My Books in the menu above) for the Cliff Knowles Mysteries page and download the PDF version of any of my books for free. This entry was posted in Uncategorized on April 15, 2019 by Russ.